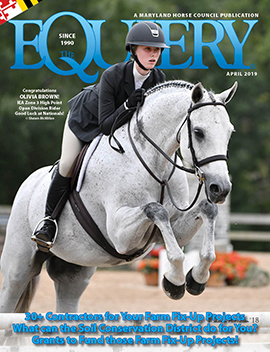 In the March 2010 print edition of The Equiery we printed the following editorial regarding equestrians and multi-user parks, with a prompt to visit this blog (equiery.com News Feed) for the hunting-related legislative bills before the 2010 Maryland General Assembly. As of press time for the March issue, very little activity had taken place on these bills, but this and next week will be quite active, as the session has just entered its final four weeks. A list of the bills and their activity as of today, Monday, March 8 appears after the editorial. House hunting bills are heard in the Environmental Matters Committee; Senate bills are heard in the Education, Health & Environmental Affairs Committee. For updates any time on legislation, visit Maryland General Assembly. Once upon a time, during hunting season, hunters were prohibited from hunting on Sundays. While this may originally have been tied-in to the now outdated “blue” laws (which prohibited everything from general retail to the specific selling of liquor on Sunday for religious reasons), it evolved into becoming a way for hunters to share public lands with other user groups during hunting season, so that the hikers, bikers, trail riders, foxhunters and more were not completely shut out of public property from September through the end of the hunting season. Approximately ten years ago (in the last century, actually), opponents to the addition of “just” two Sundays to the hunting schedule predicted that, if passed, these “just two Sundays” would be the proverbial camel’s nose under the tent, and allow for more and more Sundays to be included, in more areas, and on more types of property… and they were correct. But opposing expansion of deer hunting has always been a sticky wicket, as equestrians depend upon good relationships with farmers for a wide variety of activities (from foxhunting to eventing to competitive trail and endurance riding) and, since the farmers want to find more methods for increased deer harvest (in order to reduce crop damage), actively opposing such legislation can put equestrians on the wrong side of the proverbial fence from the landowners. Now, battle fatigue seems to have over taken trail riders and other park users. Volunteer based organizations lack the steady manpower or funding to consistently do battle, year after year, bill after bill, and philosophical conflicts of interest by those horse people who do not wish to alienate the farmers and landowners who support Sunday hunting have caused other equestrian interests to dial back opposition. As of press time for the March 2010 print edition of The Equiery, the bridle trail users have not asked MHC to be active on any Sunday Hunting legislation, nor indicated that they are active themselves. If your equine organization is still actively involved with Sunday hunting efforts, please let The Equiery know: editor@equiery.com. Many thanks to Nancy Hill for her research. Senator Haines, who represents District 5 (Baltimore and Carroll Counties), introduced this bill as an amendment to the Maryland Constitution that would establish the constitutional right of every person to hunt, fish, or harvest wild game, subject to regulations and restrictions under laws that the General Assembly would enact. This would be put to the voters of Maryland to decide in the next general election for their adoption or rejection. Establishing hunting as a constitutional right would help to protect all field sports (from deer hunting to upland game from duck hunting to foxhunting) from legislative attempts by animal rights groups to methodically outlaw hunting. On February 18, the bill received an unfavorable review, but expect to see versions of this legislation in future years. This legislation would allow property owners/renters to trap with a live trap (not a snare, body-gripping or leghold trap) rabies vector species (fox, raccoon, or skunk). They then must promptly notify Anne Arundel County Animal Control of the capture and Animal Control would then take custody of the animal. The Senate committee will hear this bill on March 9, the House committee on March 12. A Montgomery County Delegation bill that would expand the prohibition of these traps, and is being actively supported by a number of county equestrians, and was originally spearheaded by equine marketing consultant Ellie Trueman of Poolesville. Again, it is a “local courtesy” bill, is assigned to the Environmental Matters Committee, and will be heard on March 17. This same legislation was introduced last year (SB 944). It passed the full Senate 44-0 but died in the House of Delegates. This year, sponsors are trying to cover all their bases by crossfiling the bill in the House. The legislation would require the Department of Natural Resources to train rifle shooters to harvest deer in southern Maryland and would also open up further hunting season from January through March. The House version was heard on Feb. 17, and Senate version on Feb. 23, but both appeared to be stalled. Introduced by both the Allegany and Garrett County delegations, if this bill were to become law, it will allow bow and arrow hunting on the first Sunday of the deer firearms season, and Allegany and Garrett Counties will join the growing list of counties that already allow this. HB 246 was scheduled for a hearing in the Environmental Matters Committee on February 17 at 1:00 p.m. This bill was introduced last year as HB 675; it passed the House 129-10 but died in the Senate. The House passed the bill again this year (131 to 6), on March 2 and on March 3 it crossed to the Senate. It will be interesting to see what the Senate does this year. This bill would expand Sunday firearms season in Calvert and St. Mary’s Counties. Currently, hunters are permitted to use firearms to hunt deer on the first Sunday of firearms season only in certain Maryland counties. This bill would allow gun hunting on the first Sunday of bow hunting season and each Sunday in the deer firearms season in Calvert and St. Mary’s Counties. HB 301 is being introduced by Delegates O’Donnell, Bohanan, Kullen, Proctor, Vallario, and Wood and was heard on February 17, but appears to be stalled. This is a Talbot County Delegation bill that would allow bow hunting on Sunday. As you may recall, “delegation” bills are generally passed because they are considered to be “local courtesy” since they apply only to particular counties and not to the entire state. This bill has not even gotten up to bat yet. This legislation would add Baltimore County to the list of counties that already allow Sunday bow and gun hunting and would leave Carroll, Howard, Prince George’s and Baltimore City as the only jurisdictions where gun hunting on the first Sunday of deer firearms season would be prohibited. This bill (HB 663/09) was introduced last year by 16 delegates but was given an “unfavorable” report by the Environmental Matters Committee. HB 877 will be heard on March 12. Click here if you want to know how Marylanders responded to the editorial and the legislative updates contained in this post.